The present invention is a method for producing a chewing gum with a delayed release Cyclamate sweetener, as well as the chewing gum so produced. The delayed release Cyclamate sweetener is obtained by physically modifying Cyclamate's properties by coating and drying. Cyclamate sweetener is coated by encapsulation, partially coated by agglomeration, entrapped by absorption, or treated by multiple steps of encapsulation, agglomeration, and absorption. The coated sweetener is then co-dried and particle sized to produce a release-modified Cyclamate high-intensity sweetener. When incorporated into the chewing gum, these particles are adopted to enhance the shelf stability of the sweetener and/or produce a delayed release when the gum is chewed. 1. A method for producing chewing gum with Cyclamate comprising the steps of: a) mixing a quantity of Cyclamate with a spray drying solvent and an encapsulating material; b) spray drying the mixture in such a way as to encapsulate the Cyclamate and c) adding a quantity of the spray dried material to a chewing gum formulation to provide an Cyclamate level in the gum of from 0.05% to 1.0%. 2. The method of Claim 1 wherein the solvent is selected from the group consisting of alcohol and water. 3. The method of Claim 1 wherein the encapsulating material is selected from the group consisting of shellac and Zein. 4. The method in Claim 1 wherein an additional high-potency sweetener selected from the group consisting of aspartame, alitame, salts of Acesulfame, sucralose, saccharin and its salts, thaumatin, monellin, dihydrochalcone, and combinations thereof is mixed in the spray drying mixture in combination with the Cyclamate. 5. A chewing gum made according to the method of Claim 1. 6. The method in Claim 1 wherein the Cyclamate is selected from the group consisting of sodium cyclamate, calcium cyclamate, and food approved salts of cyclamic acid. 7. 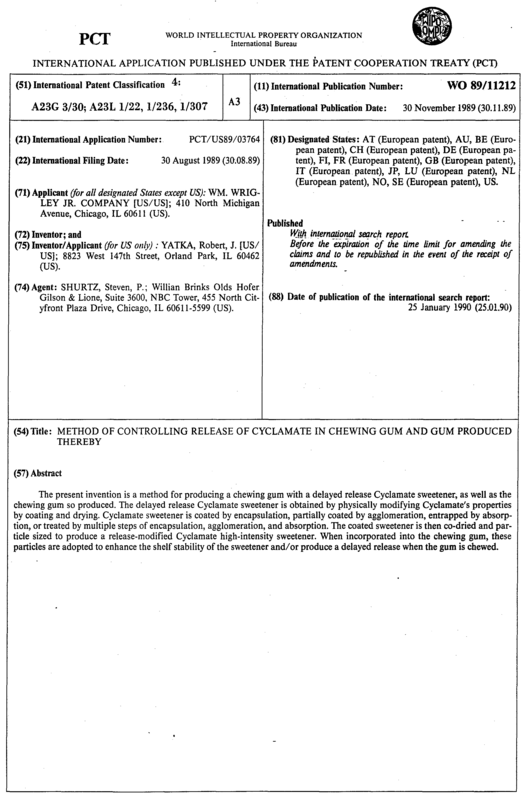 A method for producing chewing gum with Cyclamate comprising the steps of : a) fluid-bed coating Cyclamate with a solution of an encapsulating material and a solvent; b) drying said fluid-bed coated material and c) adding a quantity of the fluid-bed coated material to a chewing gum formulation to provide Cyclamate level in the gum formulation of from about 0.05% to about 1.0%. 8. The method of Claim 7 wherein the solvent is selected from the group consisting of alcohol and water. 9. The method of Claim 7 wherein the encapsulating material is selected from the group consisting of shellac and Zein. 10. The method in Claim 7 wherein an additional high-potency sweetener selected from the group consisting of aspartame, alitame, other salts of Acesulfame, sucralose, saccharin and its salts, thaumatin, monellin, dihydrochalcone, and combinations thereof is mixed in the spray drying mixture in combination with the Cyclamate. 11. A chewing gum made according to the method of Claim 7. 12. The method in Claim 7 wherein the Cyclamate is selected from the group consisting of sodium cyclamate, calcium cyclamate and food approved salts of cyclamic acid. EP0617578A4 (en) * 1991-12-17 1995-01-18 Wrigley W M Jun Co Strongly mint-flavored chewing gums with reduced bitterness and harshness.